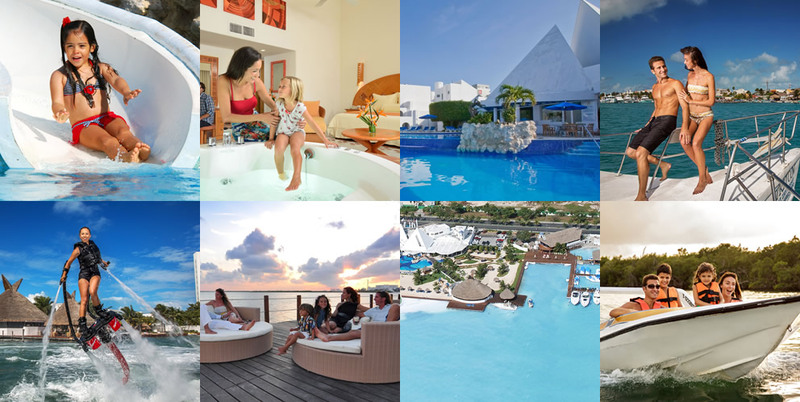 The Sunset Marina Resort & Yacht Club is a casual chic hotel designed in Mexican Mediterranean style with 161 lagoon-view or garden-view rooms. The hotel sits on Cancun’s sparkling Nichupté Lagoon. Guests have direct access to the Sunset Admiral Yacht Club & Marina for tours and yacht rentals on the lagoon and the Caribbean Sea. Sunset Marina distinguishes itself by providing the services of a larger resort with the intimacy of a smaller hotel. Sunset Marina is a charming, Mediterranean-style resort, nestled in the beautiful space on Nichupte Lagoon in Cancún’s Hotel Zone. It provides a peaceful and relaxing getaway where kids can also enjoy their vacation with areas specially designed just for them. The on-site marina offers direct access to the crystal clear waters of the Caribbean with private yacht expeditions as well as a wide variety of motorized water sports and diving experiences available. The resort also offers access to its affiliated resorts’ beaches and facilities with complimentary shuttle service throughout the day as part of the all inclusive plan.